We must begin your education by shouting very loudly that cotton blankets were never sold to Indians. Rather, they were marketed from the outset as the proper choice for the beach, car, camp, summer cabin, etc. and primarily sold through dry goods stores and giant retailers like Sears and J.C. Penney. Cotton Indian pattern blankets were produced by two companies – Beacon Manufacturing Company and Esmond Mills. Cotton blankets are generically referred to as Beacon blankets but in truth many so-called Beacon blankets are simply Esmond blankets that have lost their labels. 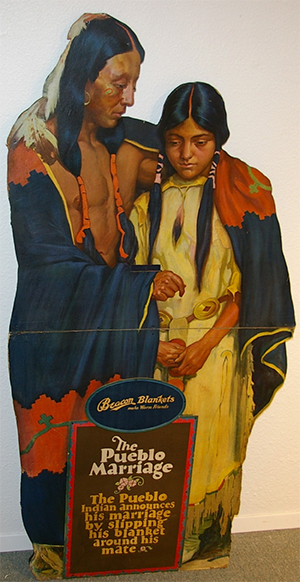 Beacon began in New Bedford, Massachusetts in 1905 and started making Indian patterns 5 or 6 years later. They opened another mill in Swannanoa, North Carolina in 1925 and eventually consolidated their entire operation there. The company closed for good just a few years ago and has since burned to the ground. Esmond Mills was located in a section of Smithfield, Rhode Island known as Esmond. Esmond was Beacon’s largest competitor not only in Indian patterns, but also in many other types of cotton blankets. Both mills began using cotton blended with synthetics such as rayon and acrylic in later years. It is only the earlier pure cotton blankets from these companies that are sought by serious collectors. WHY ARE THESE BLANKETS CALLED CAMP BLANKETS? This term originated on the east coast – these blankets were packed off to summer camps with countless young members of the Caucasian tribe. They were also used on camping trips and in the magnificent rustic Adirondack retreats known as the Great Camps. Also, they have been used at Camp David by all our presidents. I just made that last bit up and don’t think for a moment that I’m proud of myself. 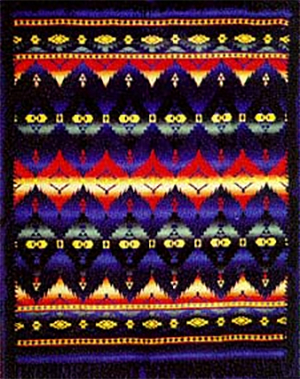 ARE THE SIZES AND DESIRABLE COLORS THE SAME AS IN WOOL TRADE BLANKETS? Pretty much. Again, 5′ x 6′ is generally the standard minimum size. Primary colors are the most desirable with one notable exception. Primarily violet or lavender colored blankets are highly prized colors in camp blankets and carry a premium price tag if condition and pattern are also excellent. SHOULD I COLLECT WOOL OR COTTON BLANKETS? OMBRE. IS THIS A SKIN DISEASE? COME ON, BARRY, WHAT THE HELL IS IT? Ombre is the name given to colors or tones that shade into each other and the ombre effect is what makes the best cotton blankets great. Beacon was the master of ombre patterns and a couple fine 1920’s examples are pictured on this page. The bane of collecting cotton Indian blankets are the old cotton/synthetic blend blankets seen at every flea market and antique mall in the country. These fuzzy and often pictorial pieces of junk most often date from the 40’s and 50’s. Serious collectors do not buy them at any price. These blankets pill like a bad sweater if they’re cleaned even once. 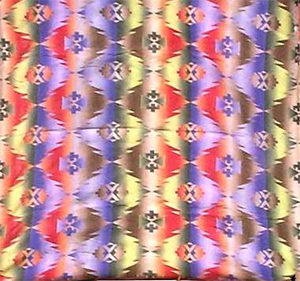 Most of the pictorial blankets one sees are these woven nightmares both in Indian and cowboy pictorial patterns. Surprisingly, few pure cotton pictorial blankets were made and though scarce are not particularly valuable. On the other hand, wool pictorial blankets carry some of the heftiest price tags in the hobby.